We’ve written about the importance of budgeting. And about how critical it is to understand how much money you need for retirement. We’ve even written about how being intentional with your money and prioritizing experiences over physical products will make you happier. But NONE of those things are as important as your personal savings rate. If you only take 1 piece of advice from us, let it be this: track your monthly personal savings rate and get it as high as you can! This simple metric will determine whether you’ll have a comfortable retirement, or whether you’ll have to work until your last days. This sounds crazy right? Why would your monthly personal savings rate be more important than say your salary? But before we explain the reason why, let’s make sure you know what we mean by monthly personal savings rate. What Does Monthly Personal Savings Rate Even Mean? Let’s all get on the same page. When we refer to your monthly personal savings rate, we are referring to the proportion of your after-tax income that you save or invest. For example, let assume you earn $2,000 in after-tax income and you contribute $300 to a 401K, $200 to a Roth IRA, and $50 to your savings or emergency fund. That’s a total of $550 that you’re saving or investing! The remaining $1,450 is going to pay your rent, buy your groceries, clothes, and cover your utilities and other every-day expenses. If we take the $550 and divide it by your post-tax income of $2,000 we get a monthly personal savings rate of $550 / $2,000 = 27.5%. Personal finance guru Dave Ramsey famously says that personal finance is 20% finance and 80% behavioral. We think he’s low-balling the behavioral component. Behavior is everything! The choices you make day in and day out are what will determine how well you live. The rest is determined by luck and the circumstances you found yourself in at birth. Not everyone starts life in the same place. So all you can do is control your behaviors within your environment. 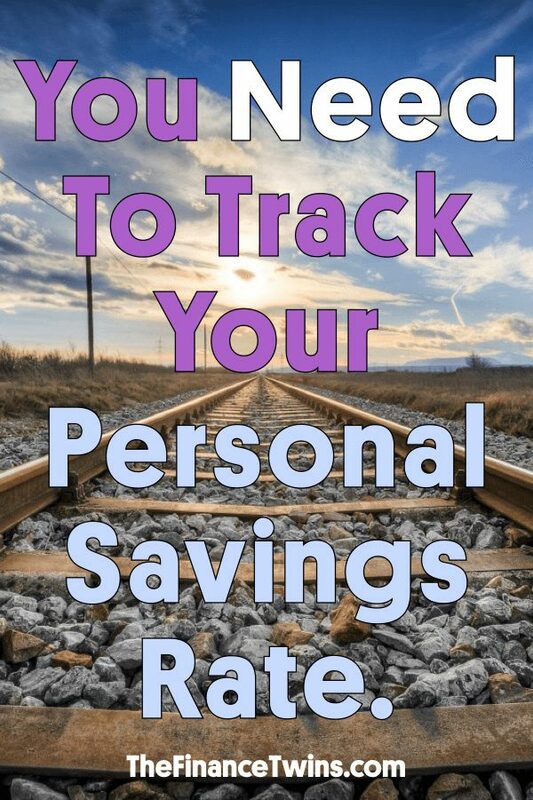 The reason that tracking your personal savings rate is so powerful is that it serves as a nice summary of your behaviors. If you tell me that you bring home $250K per year but only save $20K annually (an 8% personal savings rate), then I’ll know you’re probably not going to be able to retire the way someone earning $250K a year should be able to, unless you make big behavioral changes. Why Is The Personal Savings Rate So Important? Aside from being a good way to diagnose personal finance problems, the personal savings rate is is important for several reasons. 1. Your personal savings rate establishes your routine spending patterns. Old habits die hard. Let’s take two people who have the same exact job and the same salary. Person 1 has a personal savings rate of 0% and lives paycheck to paycheck. 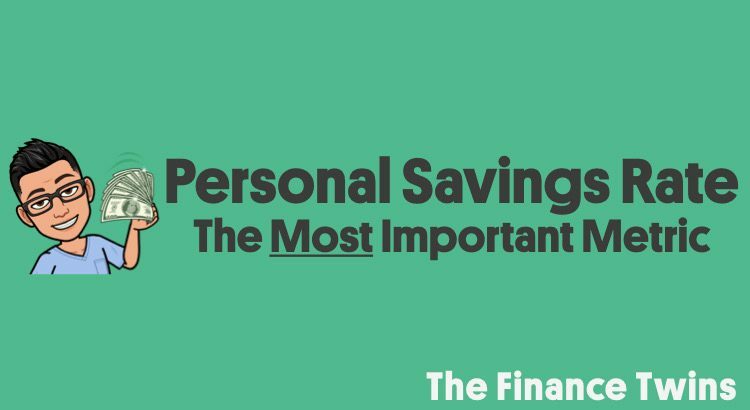 Person 2 has a personal savings rate of 15%. If we asked both of them to increase their personal savings rate by 5%, to 5% for Person 1 and 20% for Person 2, who do you think would have an easier time? At first glance you might think person 1 will have a much easier time saving only 5%. After all, they eat at restaurants or order food so often that if they can simply just prepare more of their own meals at home or pack lunches for work they’ll get there easily. Person 2 has less things to cut out, right? Well, maybe it’s not that clear cut. We’ve seen time and time again that for most people, going from 15% to 20% for a prolonged period of time is actually easier than going from 0% to 5%. Getting started is always the hardest part. Even though person 2 has less things to cut out, they are already used to cutting back on the things they don’t need. Cutting 1 more thing will be no problem. They never got used to buying a sandwich at the local deli for lunch every day. They never got used to the $35 dollar fitness class. Cutting the cable bill will be easier for them since they already understand the impact of saving money. They’ll have the motivation, confidence, and drive to make this change. There’s a reason the saying goes, “old habits die hard.” It’s because it’s true. The more you get used to something the harder it will be to give it up. For example, when Camilo started his career as an investment banker in Manhattan he rarely left the office before midnight. As a result, his company would buy the team dinners every single night. Some of his colleagues had worked there for several years and never had the time or the need to prepare their own dinner. Imagine going YEARS without cooking. As embarrassing as it is to admit, after Camilo left Wall Street it was super hard for him to start cooking his dinner at night because he was so used to just ordering in. He literally struggled to do something that the majority of people do on a daily basis. Now that it’s been several years we can laugh about it, but it’s the perfect example of how hard it is to make behavioral changes. As an added benefit, doing something like exercising instead of watching TV (after you cut the cable bill) or cooking at home instead of eating at restaurants, is much better for your health. That means you’ll get more years to enjoy your future grandkids or to pursue a hobby you love. Or to simply enjoy more years without the pain and ailments of being unhealthy as you age. 2. The more you save, the less money you’ll actually need. Once you’ve established that you can live and be happier spending less of your money, you’ll actually need to save less for retirement since you’ll be spending less money. This means that during your retirement you’ll have the ability to do the things you always dreamt of doing. Like traveling to see the Great Pyramid or the Taj Mahal. Or maybe you have dreams of selling your house and traveling the country in an RV. Or you simply have a charity you are passionate about that you want to donate some of your money too. Maybe you have grandchildren who you want to help graduate from college debt free. Whatever your dreams are, they’ll be easier to attain if you limit the amount you spend earlier in life. Even if your goal is to spend every single penny and live lavishly during retirement, spending less during your working years will help you do that! This isn’t about spending as little as possible. It’s about realizing you can be just as happy if not happier by spending less than you thought you could. After all, there are more important things in life than money. Remember, by focusing on being wealthy instead of living rich, you’ll be happier. 3. Having a high personal savings rate establishes solid fiscal skills. If you are able to live within your means, spend in moderation, and invest wisely you’ve established financial skills that you’ll be able to pass on to your loved ones. The easiest way to boost your ability to save is to build a budget. Our step-by-step guide to budgeting is the perfect place to get started! So if you have a high personal savings rate, chances are you’re budgeting, investing for the future, and making wise money decisions. But doesn’t having a high net worth also do the same? Not always. For example, you could have someone who spends all of their money and lives paycheck to paycheck, but received a big inheritance. If they look at their net worth they might think they are killing the game. Until time passes and they’ve squandered it. Tracking their personal savings rate would show them that they are in trouble early. What’s A Good Personal Personal Savings Rate? We always recommend a monthly personal savings rate target of 15% of your after-tax pay. We’ve heard some people say that they receive an end-of-year bonus so their savings might be lumpy throughout the year. As long as you hit your personal savings rate target over the year that’s okay! The goal is just to make sure you are thoughtful about how and when you are saving and investing your money. How Can I Increase My Personal Savings Rate? This is where the rubber hits the road! Here are a few ideas to get you started. Build and stick to a monthly budget. We CAN’T stress this enough. Switch to Cricket or another low cost cell phone carrier. Find a support group who will encourage you as you change your habits. Email us and ask for help. Too many people worry about what to invest in. The most important thing is that you are actually investing with the money you are saving. Thanks for reading! We couldn’t agree more with you. Choosing what to invest in is *almost* a luxury. It means you’re saving enough to invest. Great post! I especially like the example of asking someone saving zero percent and someone saving fifteen percent to add an additional five percent. I think that’s spot on. Starting is the hardest part. Thank you for the kind words, Fred! Question – Do either of the twins have cable? I have it, but my provider has failed to charge me for the past year and I have yet to inform them of their error… So I currently have cable for free! My savings goal in 2019 will be to max out my SIMPLE IRA contributions ($12,500) and have the husband max out his TSP ($18,500) which means we will have to learn to live on $2,581 ($31,000/12) less per month! I really think we can do it. I’d love to max out our Traditional IRAs too if we can, but I think we will take gradual steps first. Hi Joanna! Great question. Awesome job on the 403b! We would knock out the loans at 8.25% and 5.8%, and then invest and save as much as possible while making the standard payment on the mortgage. At the end of the day, the answer depends on your comfort with keeping the mortgage and making the minimum payment, but from a pure financial standpoint, starting to increase the savings rate and investing in a diversified portfolio of stocks will give you a boost.